Thursday looked more like winter than the last day of summer out at Sierra-at-Tahoe. A waterspout was observed over Lake Tahoe Wednesday. Construction on Round Hill Pines Beach Resort began Wednesday, Oct. 4, and is expected to conclude prior to Memorial Day 2018. Martin Hollay, a 96-year-old former Heavenly ski patroller, was honored with a trail named after him leading to this peak. Olympic skier Travis Cabral and Olympic snowboarder Hannah Teter helped unveil the new statue at Champions Plaza. 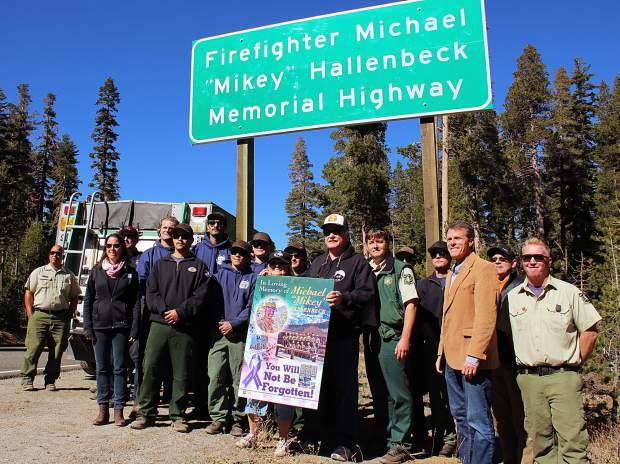 People pose for a photo by the new “Firefighter Michael ‘Mikey’ Hallenbeck Memorial Highway” signs. After hours of public comment, South Lake Tahoe City Council directed staff to draft a temporary moratorium on recreational cannabis retail sales, commercial grows, and edible production for a 45-day period. While council’s cannabis kibosh was intended to be temporary, organizers of the Labor Day fireworks had made it clear their decision to cancel the fireworks was final. Instead the holiday weekend included a 30-minute laser show at Lakeview Commons. 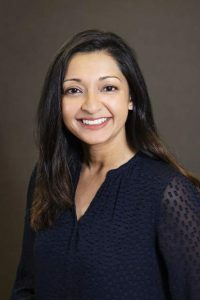 The decision by the Trump administration to end the Deferred Action for Childhood Arrivals (DACA) program sparked responses across the country, including in South Lake Tahoe. 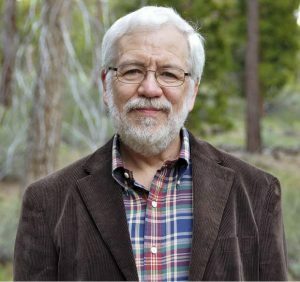 “Everyone we’re in contact with regarding DACA is just scared, you know, [they] don’t know what to expect because of all the political rhetoric,” said Bill Martinez, executive director of the South Lake Tahoe Family Resource Center. 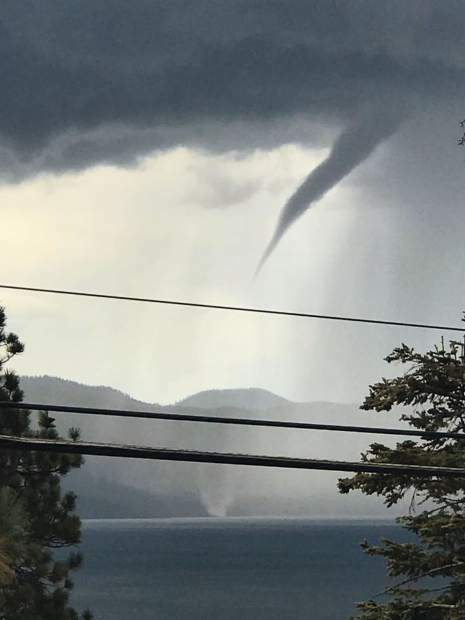 Tahoe got a taste of some unusual weather in September when a funnel cloud briefly touched down on the lake. “They’re fairly uncommon but we do have them,” said Tony Fuentes, a meteorologist with NWS in Reno. El Dorado County released the final draft of the 145-page Meyers Area Plan, the land-use and zoning plan for the community intended to be re-examined every five years. Among a slew of proposed projects, the updated plan includes a comprehensive look at the already-underway Meyers Corridor Operational Improvement project, which seeks to construct a “multimodal complete street strategy” by adding more lighting, signs, crosswalks and other roadway improvements to the stretch of U.S. 50. 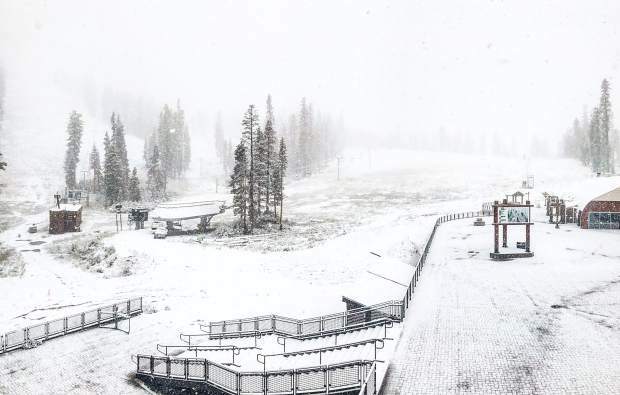 The final day of summer felt more like winter as the first measurable snow fell around Lake Tahoe and elsewhere in the Sierra Nevada, stoking excitement among skiers and boarders while wreaking havoc on some roadways. Heavenly Mountain Resort dedicated a trail to Martin Hollay, a 96-year-old former ski patroller who hit the slopes 100 days the previous winter, during a ceremony. Heavenly also honored Hollay by naming a stretch of trees that he planted on the mountain after him. 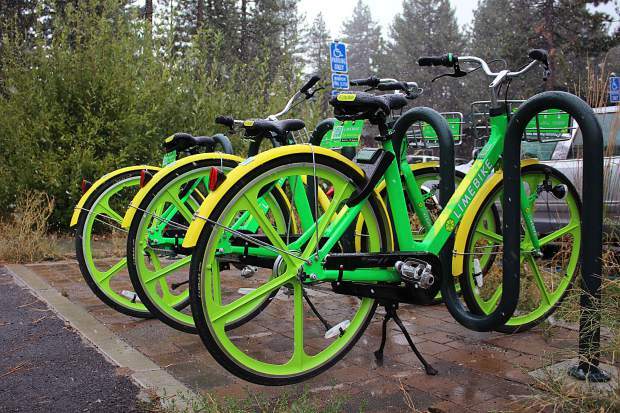 LimeBike, the bike sharing company that arrived on South Shore earlier in the year, announced its plan to remove its 200 bikes from South Lake Tahoe, concluding the three-month pilot project that was the subject of much debate. Despite some backlash from the local community, usage data points to a successful launch, and LimeBike said it’s looking forward to returning next spring. Kingsbury Middle School went back on the market, after Douglas County School District Board of Trustees voted to hire a consultant to help them sell the building. A Glenbrook-based company previously made an offer on the property for $3.15 million, but the offer fell out of escrow in July. 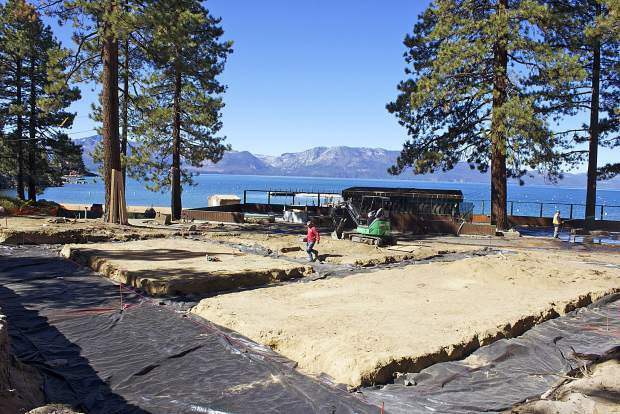 Sticking on the Nevada side of South Shore, construction started on a new dock and breakwater, along with a new restaurant and beach pavilion, at Round Hill Pines Resort. “This will be a major upgrade to the property and benefit for our guests and the environment,” Kris Knox, the resort’s corporate general manager, said. Speaking of environment, the South Lake Tahoe Unified School District board unanimously adopted a resolution supporting expanded energy efficiency programs and sustainability improvements. Family and friends of Michael “Mikey” Hallenbeck gathered on the side of U.S. 50 near Echo Summit to unveil new signs marking the stretch of highway as “Firefighter Michael ‘Mikey’ Hallenbeck Memorial Highway.” Hallenbeck was a U.S. Forest Service firefighter who also worked at Sierra-at-Tahoe. He was killed Aug. 8, 2015, after a dead tree fell on him while fighting a fire near Echo Summit. Lake Tahoe Community College students got a leg up on navigating South Shore after the Tahoe Transportation District Board of Directors approved an agreement with the college to allow current students with a valid LTCC identification card to ride all local transit services at no charge during the academic year ending June 30. The agreement is a pilot partnership between the college and TTD. In city news, South Lake Tahoe City Council began considering varying degrees of a polystyrene ban — often referred to by the brand name Styrofoam — in restaurants and other retail stores. Back in 2013, City Council discussed banning single-use plastic bags and polystyrene at retail establishments within the city. Though the city moved forward with a ban on plastic single-use carryout bags — later bolstered by a statewide ban on plastic bags — no action was taken to prohibit polystyrene. Race organizers announced the 13th annual Amgen Tour of California will return to South Lake Tahoe in 2018, while the women’s race will visit the community for a fourth straight year. 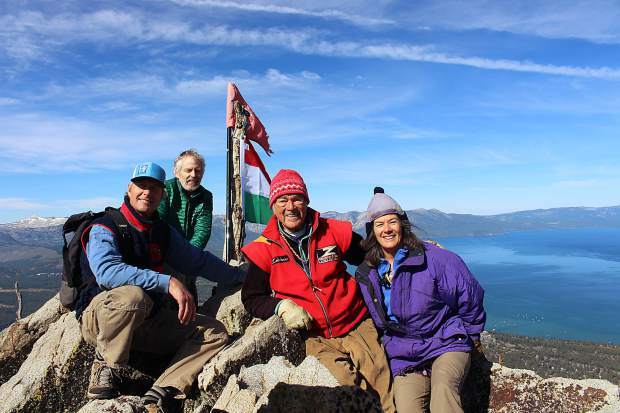 The race provides significant national/international media exposure, according to Carol Chaplin, president and CEO of the Lake Tahoe Visitors Authority. South Lake Tahoe’s newest public art installment was unveiled during a ceremony at Champions Plaza. Montana-based artist Gareth Curtiss created the 11-foot bronze sculpture, named “Spirit of Competition,” that was inspired by local Olympic athletes. Retired Judge Steven Bailey formally announced his campaign for California attorney general in the 2018 election. As a Republican, the retired judge faces an uphill climb — the last time a Republican won a statewide race in California was 2006. 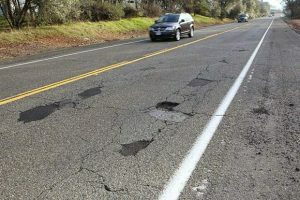 On elections, Measure C, a ½-percent sales tax increase that would raise money for the repair and rehabilitation of South Lake Tahoe roads, failed to clear the necessary two-thirds vote threshold. Of the 2,211 votes counted in the unofficial results, 54 percent (1,194) voted in favor while 1,017 people (46 percent) voted against it, according to unofficial results from the El Dorado County Elections Department. South Tahoe’s McKenna Brewer signed her National Letter of Intent to play for the Sonoma State University Seawolves, a division II school in Rohnert Park, California. Brewer wasn’t the only student athlete to sign a National Letter of Intent. South Tahoe runner Ally Sullivan inked her intentions to attend St. Mary’s College, a private division I school in Moraga, California. Nurses at Barton Health voted to unionize, a move that will undoubtedly alter how one of the area’s largest employers interacts with some of its most vital employees. Out of the approximately 150 nurses who were eligible to vote, 123 voted in favor of joining the California Nurses Association (CNA), while 17 voted against unionizing. The El Dorado County Sheriff’s Office confirmed that two bodies were recovered from Fallen Leaf Lake over the course of the last 2½ months. One body, identified as an adult male, had a rope tied around the lower portion of the legs and a small anchor was tied to the end of the rope. Verde Mexican Rotisserie closed its original location in Meyers. Owners Katy and Domi Chavarria opened up their second restaurant in The Crossing at Tahoe Valley in July, but after five months of running two locations, they made the difficult decision to shut down the Meyers operation. “It was purely based on the fact that we just wanted to be with the family more. Running two restaurants with two small kids is extremely hard,” said Katy. South Lake Tahoe City Council approved the final reading of amendments to the vacation home rental code, including a 1,400 cap on permits allowed in residential areas. Other changes include a bear box requirement, ranging from two- to four-can sizes, based on the square footage of the home; increased fines from $250 to $1,000 without a warning; and a three-strike policy within two years, which results in a permit revocation. The rules only apply to VHRs outside the tourist core. Authorities arrested a person of interest — a previously deported ex-felon — in connection with an October homicide at a Stateline casino. The University of Nevada, Reno Police Department arrested Jose DeJesus Rodriguez-Quezada after receiving reports of a suspicious person sleeping on a sidewalk. Rodriguez-Quezada was identified as a person of interest in the killing of Kevin LeRoy Edwards, who was found dead inside a room at the Hard Rock Hotel and Casino in October. Former Heavenly Mountain children’s ski instructor Stephan DeGraffenreid was sentenced to 15 years in prison for sexually exploiting a minor. The 26-year-old Gardnerville man pleaded guilty in September to one count of sexual exploitation of a minor and two counts of attempted sexual exploitation. He could have faced up to 45 years in prison. Sierra-at-Tahoe opened for the 2017-18 season on Dec. 2. When it did, Sierra became the third resort on the south end of Tahoe to open for the season. Heavenly Mountain and Kirkwood Mountain resorts both opened in November. Poké Rok opened in The Chateau at the Village in the former Snø Frozen Yogurt Café location. The latest craze in fast-casual food sweeping across America, poké (pronounced POH-kay) is a Hawaiian staple containing raw pieces of seafood coated in a tangy or spicy marinade. It’s often garnished with seaweed, cucumber, edamame, avocado or tobiko and served in a bowl over rice or greens. 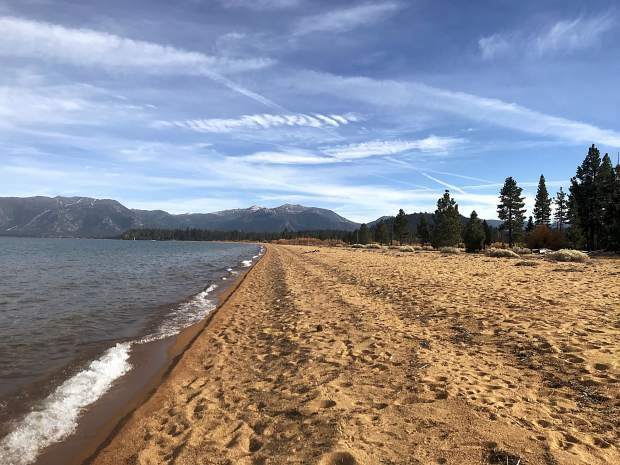 In the seemingly never-ending vacation home rental news, the Tahoe Neighborhoods Group submitted a new petition seeking to put vacation home rentals in South Lake Tahoe residential areas to a vote. The initiative seeks to eliminate all vacation rentals outside the tourist core over a three-year period, with exceptions for permanent residents — defined as a homeowner who resides in the city for a majority of the year and has the tax documents to prove it. Permanent residents would be allowed to rent out their home or a unit on the same parcel for up to 30 days a year. Speaking of controversial topics, South Lake Tahoe City Council unanimously approved a temporary moratorium on recreational marijuana businesses. The move is intended to prevent such businesses from opening after Jan. 1 but before the city can adopt regulations for the recreational cannabis industry. Several councilmembers hope to have local regulations created and in place by June. South Lake Tahoe was far from alone in making that move. The El Dorado County Board of Supervisors approved a 45-day urgency ordinance banning commercial and medicinal marijuana activities. The South Lake Tahoe City Council also approved the hire of Host Compliance, a third-party service to deal with illegal vacation home rentals. The annual cost of Host Compliance is $118,400. Council, on a 4-1 vote, also approved an 8.81-percent increase for residential garbage pickup and disposal in South Lake Tahoe as requested by contractor South Tahoe Refuse. Lastly, council unanimously selected Wendy David to serve as mayor for the next year. Council also unanimously selected Tom Davis to serve as mayor pro tem for the next year. Harrah’s Lake Tahoe said “no more” to free parking for skiers and Heavenly Village visitors who are not patrons of the Stateline casino. Harrah’s installed signs informing drivers that the parking lots are reserved for patrons of the casino. A security firm is now patrolling the parking lots to ensure compliance. On a more positive note, South Tahoe High School senior McCallan Castles signed his National Letter of Intent to attend and play football for the University of California, Berkeley. He inked his signature in front of family, friends and coaches in the strength and conditioning room at the high school. On a less positive note, new numbers from the U.S. Forest Service showed 27 million trees died across California in the past year due to drought and bark beetles. In the Tahoe Basin, 168,000 trees died this year on the lands managed by the U.S. Forest Service Lake Tahoe Basin Management Unit, bringing the total over the last 10 years to 304,000 dead trees on 40,000 acres.